I fear a lot of these blog posts have been like jumping into a movie halfway, making it rather inaccessible for someone who is landing on this website for the first time. I really would like to avoid this, so I am going to come up with some kind of elevator speech to put in front of these very domain specific blog posts, to make them more accessible. This website holds that the final 7-years prior to Christ's Millennial reign on earth (Dan. 9:27) could start as soon as 2021. This is due to the fact that the European Union has a cyclical 7-year program with Israel. Second, this website holds that the European Union is the revived Roman Empire predicted in the Bible. Third, this website holds that Javier Solana is the top candidate for Antichrist. This is due to the fact that he fulfilled at least 3 very specific prophecies about the Antichrist. Nevertheless, this theory seemed dashed to the ground, when Javier Solana "retired" in late 2009. Yet surprisingly, as of 2015, he seems to be in the position to make a surprise comeback at the age of 75. You can learn all about this and the evidence behind it at the video or article overview at this link here. This article will discuss political forces in Spain which may allow Solana to become a potential nominee for an EU position. Yet, before diving into this, we need to discuss how EU horse trading works. Many past blog posts have explored developments with the European Union, especially in the field of military and defense, and future positions that could open up there for Solana to fill. As we have seen in the three blog posts on European Defense Fund, the EU will soon be seeking someone in leadership over this. This is something that Solana is very qualified for and potentially very interested in. Furthermore, to top it all off, the European Defense Fund has 4 solid "666" connections to it. In the past, there have been strong 666 connections to Javier Solana or some prophecy he fulfills. Whenever there is a top position at the EU level, it is the heads of state and government that put forward nominees. Even though the nominees do not represent the nominating country, but work on behalf of the EU, they are still nominated in this way. This entails lots of "horse trading." For example, if there are not enough women in the top posts, too many Italians, too many northerners, too many conservatives, the EU leaders jostle with one another and make trade offs as to who gets what, to maintain a "balance" of some kind. Consequently, when making all these trade offs, the EU ends up being very undemocratic in it's selection of the top leadership roles. Most of this happens every 5 years, whenever there is a new Commission. However, precipitating circumstances can cause it to happen at other times other than that. Speaking of which, it's summer break time in Brussels. Though it may be all quiet on the EU-front for a few weeks, it is merely the calm before the storm. There are a lot of exciting things coming up. September 22 - 3 month deadline for agreeing to PESCO criteria is up. These criteria basically determine who is eligible to participate in the EU's new defense club. September 24 - German federal election. Merkel is likely to win, but even if Schulz does win, he is probably even more pro-integration than Merkel. Once the election happens, Merkel and Macron (or Schulz and Macron) can further develop the EU agenda without fear of the electorate. October /November - Top job jostling for Eurogroup Presidency begins. 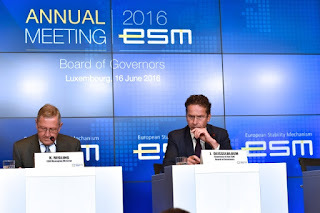 The Eurogroup president leads meetings over the finance ministers of eurozone countries, and presides over the EU's powerful bailout fund, the ESM. 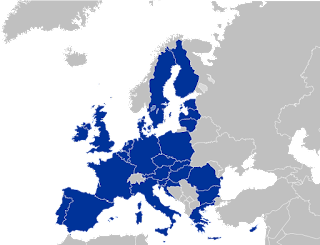 December 15-16 - Is likely going to be another important milestone for European defence, since they are making PESCO criteria and need to decide membership. Early 2018 - Parliament and Council will have ratified European Defence Fund into law. A leadership structure will need to be agreed upon by then. Projects may begin at this point. Early 2019 - First project of European Defence Fund will be able to start. Late 2019 - Brand new European Commission. Juncker has already said he won't go for a second term. With the launch of the European Defence Fund, would be a good time to formally designate someone as defence commissioner. The Eurogroup presidency is very high profile position, and is very powerful. This person has a very significant amount of influence on how bailouts are delivered. Furthermore, since the European Defense Fund (EDF) will be used to fund projects within the EU's defense club (PESCO), they will have to agree on how PESCO and the EDF will be governed around the same time. Since the PESCO criteria have to be agreed by end of September, and defense decisions will be taken in December 15-16, they will need to at least agree on a governance structure and start thinking about how it is going to run/who is going to run it. So we might be hearing names thrown around for "EDF President (?)" being thrown around late fall or early next year. In my last analysis, I talked about how Revelation 13 describes two beasts, one of whom controls the guns, and the other controls the money. We can see the embryo of these two beasts beginning to form, with the Eurogroup presidency on the money side, and the EDF/PESCO leader on the other. Spain's finance minister, Luis de Guindos, has always wanted to the Eurogroup presidency. Nevertheless, when the Dutch ministers Eurogroup term ended after 2.5 years, they voted to keep him for another 2.5 years, much to de Guindos' chagrin. 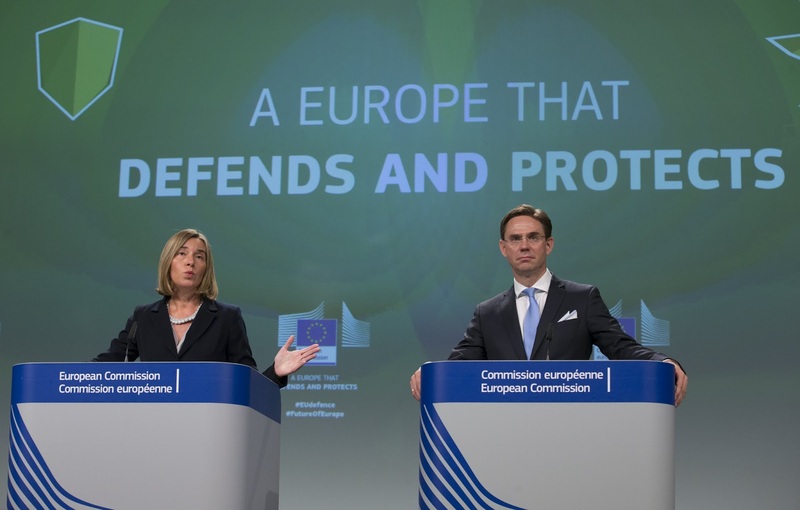 I report on the upper level EU politics, especially in the area of defense integration. Nevertheless, all the jostling that will take place at the EU level only show one side of the equation. National politics are very important as well, in determining who will be nominated in the first place. For example, in 2014, Italian PM Renzi pushed to have his foreign minister as the EU's next High Representative. Although she doesn't act on Italy's behalf, it is a highly political consideration on who gets to pick nominees for the top EU level jobs. The government in power will play a significant role in who gets nominated for these jobs. Which brings us back to Antichrist candidate Solana. Since Javier Solana is from Spain, it behooves us to understand what internal forces are at work that could potentially get him nominated for some kind of EU position. Mariano Rajoy is the current prime minister, and is the leader of Spain's "Popular Party" (PP). Nevertheless, his re-election and coalition building process was particularly agonizing. Spain's Rajoy was caretaker prime minister for 314 days despite numerous inconclusive elections. Only when the Socialist party abstained from voting was he able to form a government. The Socialist party (PSOE), has had its own internal drama as well. The current party leader Pedro Sanchez was kicked out, only to return later. Javier Solana has held various ministerial positions in the Spanish government as a PSOE member. He is considered "old guard" and has influence in that domain due to his past experience, despite not trying to influence the outcome too much. Nevertheless, his opinions about Spanish politics on Twitter carry a lot of weight. Long story short, it would be much easier for Solana to get nominated if there was a socialist government. I have been praying for wisdom on how all this prophecy stuff is going to play out. 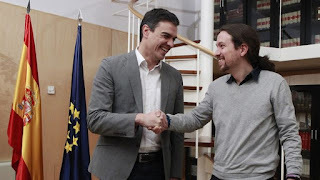 As a result, in a 24 hour period, I saw numerous 666 connections to Sanchez + Podemos articles and articles about the return of Pedro Sanchez, PSOE party leader. I did not google any of these after finding one. They just appeared. Here, in this article, Solana acknowledges that Pedro Sanchez will be the next PSOE leader, and doesn't have any weird views on that subject. This article, written on 06/06/16, talks about how PSOE has a fresh new progressive agenda with the comeback of PSOE leader, Pedro Sanchez. The picture below is one of Sanchez. I highlighted the 666. 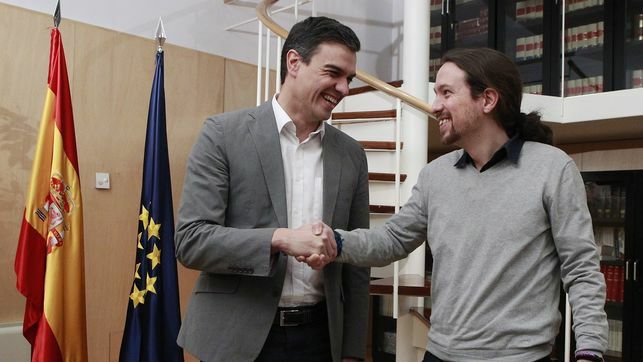 This article talks about how certain more radical left-wing groups opposes the new cooperation between the PSOE's Sanchez and the left-wing anti-austerity party Podemos. In other articles I have been seeing on Twitter, PSOE and Podemos are trying to work together on some legislation, despite having had difficulty in the past forming talks. One article I read said the goal is ultimately for PSOE and Podemos to have a government that can overthrow Rajoy. With all this top job jostling, whoever is in charge of Spain is going to have an influence on who Spain nominates. For the Spanish Prime Minister, Mariano Rajoy , the historical fact is more " the launch of the European Defense Fund. A great advance. We are waiting for negotiations with the European Commission to see how these funds will be managed. This will help the domestic industry, especially SMEs . "" 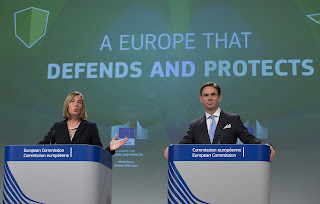 Europe of defense is one of the areas where we can move forward with great determination in the EU. " As for the PESCO, the launch " within a reasonable time " will " give the European Union the capacity to respond to challenges. " The leader of the Spanish Popular Party also sang a little self-celebratory air. "Spain is one of the main instigators of this policy which seeks to give the EU a major strategic autonomy . He also pointed out that Madrid was " currently the first contributor " of CSDP missions. As for the battlegroups , which Spain has been contributing to for 10 years, we believe it is a useful instrument for resolving crises . In an interview Solana stated that Spain has lost weight in the world. On Twitter, a socialist member of European Parliament stated that, in wake of the 1st anniversary of the Nice attacks in France, the EU needs police, intelligence, and defense to fight Jihad. He goes on to say that "Spain must lead that unit." Javier Solana retweeted it, which could be very telling. I wonder what person in Spain is most qualified to "lead that unit?" I wonder who could be nominated?? Spain is very underrepresented in the top jobs. So if a post for leadership of the new EDF comes up, Spain could potentially be allowed to put forward a nominee. Will a PSOE Government Nominate Solana? The two big items that will be coming in the future is the Eurogroup presidency and likely the EDF/PESCO Chair. France feels underrepresented in Eurozone bodies, and the current EU commissioner for Economic and Financial Affairs, Moscovici, would like the Eurogroup job. This is consistent with the EU Commission's wishes to merge the economic and finance commissioner job with the Eurogroup president. If Spain doesn't get the eurozone portfolio, they will demand something. Perhaps with Sanchez as future Prime Minister of Spain, Solana will be put forward to lead the EU's new defense fund. Which is what all the 666 connections to the EDF would have us believe is very likely. Solana has been working on defense integration stuff, and even advised EU parliament on the subject. He is the perfect candidate. One of my good friends says that, knowing what we know, the probability of Solana coming back is high. However, at the moment, it is "whispers and shadows" like they say in Lord of the Rings. Lot's of political intrigue. I can't wait until, Lord willing, there is a lot less political intrigue and simply facts on the table! I love your comments! What do you think? Which parts do you agree with? Which parts seem far fetched? Come soon Lord Jesus! May he give us wisdom that transcends human understanding and wisdom only he can provide. security and defense for the eu really are picking up some steam as we conclude year 2017 and head into 2018. must to watch! much! something is going to be a breakout event and i think a breakout person will come to light too. i certainly wonder about solana's role to play here. too many things about him seem to push a front and center position in the making and he isn't getting any younger, so to me if he does have a role to fulfill it will come about soon. 2018 soon? well, we'll see...as they say--stay tuned. thanks always for the good insights and good reporting on this front. i still think you are looking in the right directions and appreciate your diligence! and i continue watching with you......may the Lord give you that wisdom you seek, me also. we'll need it. Andre' great to hear from you! I completely agree it is really picking up steam. Some types of negotiations on PESCO Criteria are being finalized behind closed doors as well. I very much agree a breakout event is imminent. They have to choose a new Eurogroup president on Dec 4. They also have to (possibly) choose some kind of defense assistant or chair to chair the PESCO council formats. Furthermore, I agree with you that Catalonia could play a big role, as Rajoy is gambling his political capital. If he gets too heavy handed the socialists could bring him down. With the Socialists in charge, Sanchez is poised to nominate an old guard socialist, such as Solana, for an EU position. (The EU is short on socialists as it is). Thanks very much for watching with me and for your kind words. May God fill us with all wisdom as we trust in him. I was going to wait until december to post. But I think you have inspired me to post again. If solana comes back, then it will be proof that we have wisdom from God most High, not mere human wisdom, because only because of God could we possibly know the future. Blessings to you Andre'! also catalonia has it's part to play in upping the ante, doesn't it!?! very timely in my book.